Okay, first of all, how is it even possible to have too many favorites for a tea flavor? Honestly, I am becoming a tea hoarder already because of English Tea Shop!! 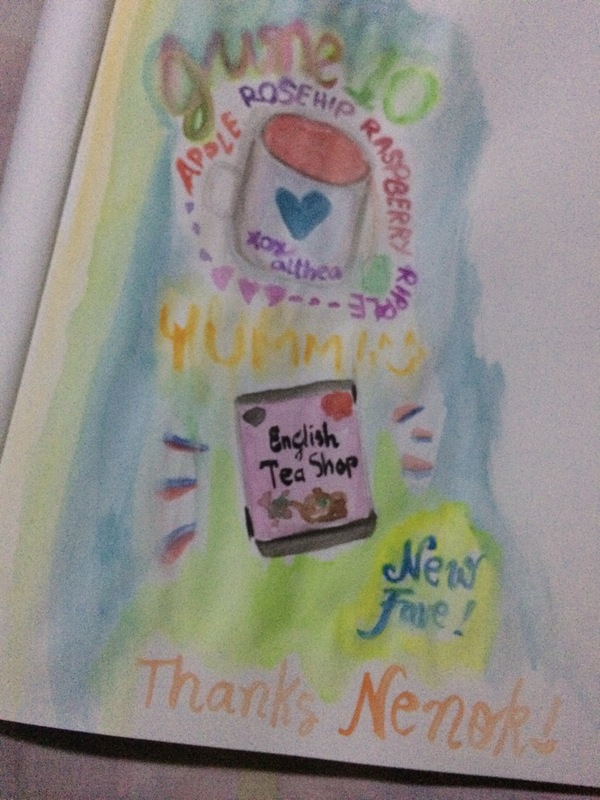 I have yet to do a review for English Tea Shop teas but let me do this one first. Before the weekend, I was so stressed out that I felt really bad about everything so it came to a surprise when my friend Vannessa (yes it is spelled that way) gave me a surprise teabag! It is the English Tea Shop Apple Rosehip Raspberry Ripple one and I loved it!!! Days passed and I was on a quest for that same tea but groceries near our house only have the normal ones. I tried looking for it at different supermarkets as well but didn’t have any luck at all! So last night, I asked Kyx that we try to visit Robinsons Supermarket, just a few minutes away from the house. We did grocery shopping first at a different supermarket then drove by the Robinsons Supermarket after. I headed to the tea shelves the minute I step foot in the store. I was so glad to find English Tea Shop flavours there!!! Golly geez. But didn’t have the Apple Rosehip Raspberry Ripple. I then decided to get the collection and the Cranberry Vanilla Delight one! I didn’t stop my search there so I looked for the other tea shelf and there I found, My Apple Rosehip Raspberry Ripple! I actually spent like a 2 week grocery shopping budget on 3 boxes of tea because I had a hard time deciding and Kyx is anxiously waiting inside the car so I just shoved 3 boxes in my basket. I blame myself for not being able to find the flavor I was looking for instantly that I ended up deciding on a different one then seeing what I actually like. Which then resulted to me–spending way more than I should on tea!!! Please don’t judge me. I am not really an impulsive buyer. 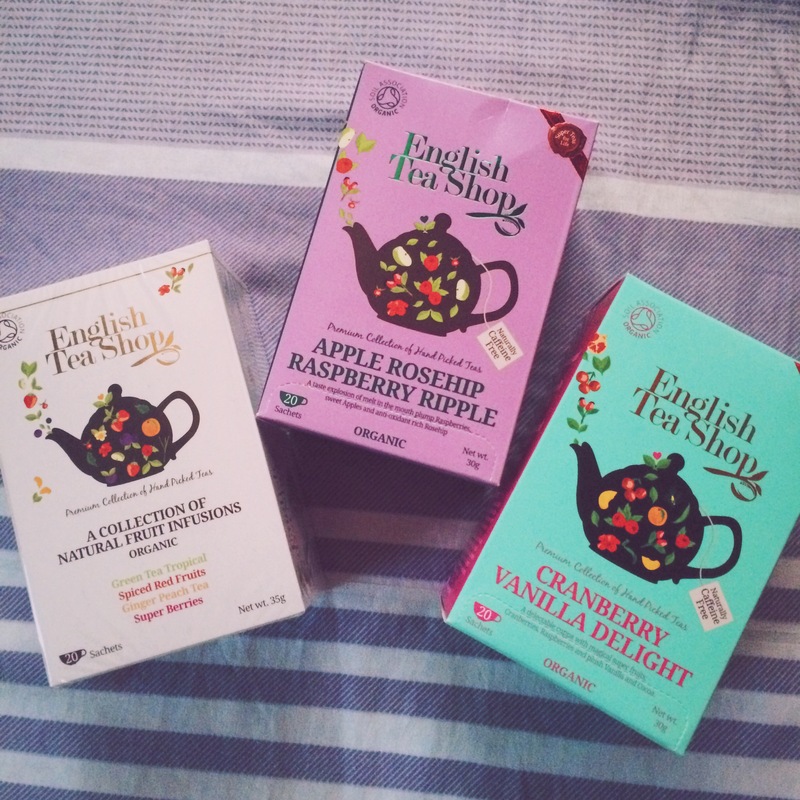 I just really love tea and I am so excited to try different flavors from English Tea Shop! I got the Collection which contained 4 flavors, 5 of each flavors inside the box. 1 box of the Cranberry Vanilla Delight and my favorite Apple Rosehip Raspberry Ripple! I have tried the Cranberry one and the Apple Rosehip.. I also am drinking now the Spiced Red Fruits flavor from the collection I got. So far, I can’t decide which flavor is my favorite! Apple Rosehip Raspberry Ripple is still on the number 1 spot while Spiced Red Fruits is 2nd. While I like Cranberry and Vanilla, I can’t decide whether I liked the Cranberry Vanilla Delight flavour. I guess I shall try it again tomorrow. I gave Rio one teabag from my Cranberry Vanilla Delight and she LOVED IT. I am still awaiting Vannessa’s verdict about it. What are your favorite tea flavors? Do let me know! Slept an hour early last night because I was too damn stressed for Friday. I had to end it the moment I can. Went to the office, ate a chocolate croissant and had . It was an okay day. I don’t want to talk about work anymore. Just thinking about my office is making me crazy haha. After eating, we went and used our free tickets to watch The Conjuring 2. We are not fan of horror films but since there aren’t any marvel films on the theatre now and nothing interests us more, we tried to see what the fuss was all about. It was a bit scary thinking that it happened in real life. The film is bearable and the way they told the story and executed everything seems amazing to me. I enjoyed the film! We ate ice cream after that. Our favourite Sea Salt Caramel at Merry Moo! I tried looking for my L’Oreal serum, Tea to try and a couple of biscuits I wanted at the grocery store BUT EVERYTHING ISN’T THERE OH MY GOD. HOW FRUSTRATING. Went home, fixed our room a bit and now I am blogging! I have a makeshift blogging table now and I love it so far. Now I am off to finish my tea, probably try to paint several geeky stuff and read Me Before You. I am halfway through it and I don’t want to finish it yet BUT I want to finish it before the movie comes out (in case there would be spoilers on the internet, which would highly be VERY POSSIBLE) so maybe I shall finish it tonight! How was/is your Saturday? I hope you enjoyed it as much as I did! The photo has terrible quality but I guess I shall try to redo it again soon. Well, I really had a close to terrible Friday and it’s crazy! For a teaser, there’s nothing that Tea cannot fix and there’s nothing better than a friend who’s there for you when you least expect it.